SAN FRANCISCO: This week were looking at the Oldsmobile Silhouette and its so sad that it also comes at a time when Olds, the granddaddy of all automobile manufacturers, is being phased out of existence. I grew up with Oldsmobile and Ill miss it. I suspect dad leaned toward Olds because it was one of the early car companies that he grew up with. He was from the same old school, and when he wasnt driving in those grand old machines, he was flying around in those other new inventions - airplanes - of the early 1900s. They were the pioneers who spent cold nights working on all those new gadgets coming out of the industrial revolution. Those must have been exciting and exhilarating times. I can visualize them driving around, sharing dirt roads with horses and buggies. They must have impressed the ladies with their antics, and surely would have been admired by every little boy they passed. Today, the technological age keeps those pioneer spirited people indoors with their fancy new mega gigahertz, gigabyte, rip roaring computers with five-foot flat screens hanging on the wall to impress other computer nerds, who also rarely see the light of day. Ive been one of those computer guys for over 25 years and I love it, but the mystique of the past is somehow more romantic and fun to consider. Some of us still hang onto remnants of the past, and I guess its time to saddle up and go for a ride in the backcountry, cut a few cords of wood and feel like a man again. Ill do that right after I finish mending those fences. Continuing down memory lane, I think Ill also miss Olds, when I think back to those days when I'd stop to body surf at Laguna on my way back to the San Diego Naval Base in my black 1949 Olds 88 hard top coupe. For the life of me I cant see why GM decided to stop building this history-making car line. Oh well. This Olds, like other Minivans, is soft riding and comfortable. It has all the power youll need in this class of utility family car, unless youll be pulling a boat or have a need to go off road. I can't think of a better vehicle for families and all those Soccer Moms who have to shuttle the kids to and from. I really felt at home driving this Silhouette  like an old friend. But it helps when you feel good about what you spend your hard earned money for. 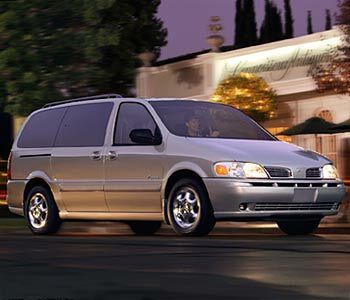 This is a very pretty and classy minivan you can drive to any occasion. And the fit and finish is as good as they get. As for Conveniences, this thing is loaded, and of course the price reflects it. The entertainment center is wonderful to keep the kids and grandkids occupied while you listen to the radio, or simply talk about things they dont care about anyway. The power sliding door on the passenger side is indispensable. There is no question I'd find a way to justify the extra money to have this option, especially for the children. Another nice item is the sensor that audibly lets you know when youre getting close to objects while backing up. Column Name: "I still have a love affair with Oldsmobile"